Eventually, the time will come for you to replace your roof shingles. Many homeowners start to think about reroofing when they see their neighbors getting their roof done. Homes built during the same time period and in the same location tend to experience the same type of wear and tear. The sun shines on their home at the same angle, and they experience the same weather conditions. If you see your neighbors getting their roof replaced, it’s time for you to start thinking about it as well. If your roof is starting to look old and worn, it’s a good sign it’s time to at least have it inspected by a professional. If your shingles are more than 15 years old, now is a good time to have them inspected. The odds are they have begun to wear down. Missing shingles can happen for a couple reasons. They could have started to loosen up over time because they have dried up, cracked or curled. Or you could have had a strong storm that caused them to come loose. If you are missing shingles, your roof is more vulnerable to water. At the very least, a patch job will be required. This happens when shingles dry up and start to crack over time. There is no way to correct this. 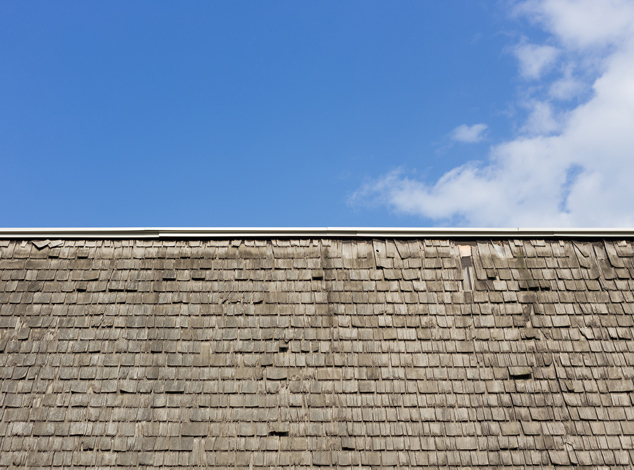 If you notice this in a number of areas on your roof, it’s a sign a replacement is in order. Bald spots where granules should be is a sign of worn shingles. Granules are the small particles on the top layer of shingles. Granules protect the asphalt in the shingle from being damaged. If it does get damaged, water issues could occur. If you see granules in your eaves or downspouts, have your shingles inspected. Moss growth is normal, especially on the areas of your roof that get little sunlight. However, a large amount of moss on your shingles can begin to damage your shingles and cause water leaks. If you notice moss, have it inspected and cleaned. Dark streaks are also commonly found in aging roofs. While it may not cause damage to your shingles, it’s a sign of algae and of age. Keep an eye on the streak and make sure the shingles do not start to wilt or that moss is not growing in the area. If you notice these signs, at the very least, it’s time to have your roof inspected. Our team at C Plus Roofing would be happy to come out and take a look and provide you with a free estimate to replace your roof shingles. Request a free estimate! Residential Asphalt Roof Shingles – What Are They Made Of?